TOUCHED BY AN ANGEL: NJC 1ST BIRTHDAY ITS BLOG HOP TIME ! NJC 1ST BIRTHDAY ITS BLOG HOP TIME ! Hi everyone I hope that you are all well and happy. Welcome to my little bit of blogland. I have some amazing news to share with you all! The Lovely Lori Thomas the owner of the NJC challenge blog recently asked me to work alongside her on the blog not only that im delighted to say that she made me co - owner also. It is an amazingly popular blog with well over 600 entries this month and we have a super talented DT too that give plenty of inspiration! But enough of my rambles its CELEBRATION time! One lucky person who comments on my blog will win the image I have used. Tina - You are here ! You much have taken my picture when I wasn't looking. I look like this poor lady every morning - except I have a Pepsi in my hand. I checked back for the blog hop and I'm so glad I did! Your tag is super cute! This image is so fun! Beautiful colouring as well! That is gorgeous! Love the image.. Love all the pink! Just fantastic!! This is gorgeous. I love the image. Oh, how cute is this! Love it! Hi, beautiful images and colors...sweet!!!! Thank you so much for joining me in running Not Just Cards, your in for one hell of a ride with me kiddo, so fasten your seat belt and off we goooooooooooooooo!!!! Lets have fun! Tina your tag is awesome. 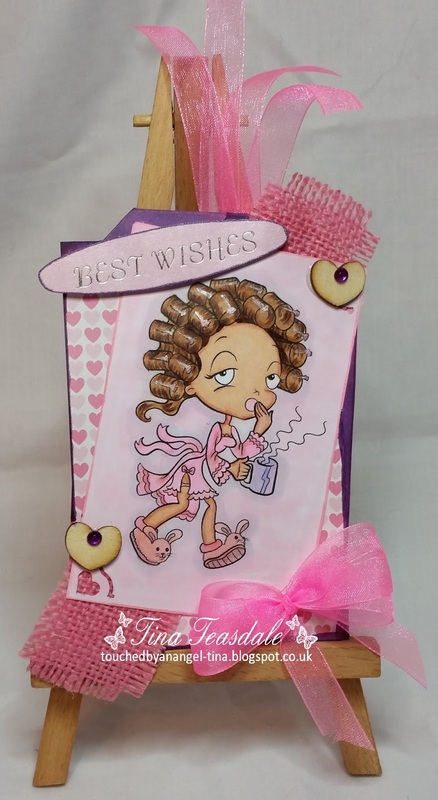 Love the stamp, all the pink and your texture and embellishments. Thanks for sharing your talent and inspiration. What a great blog hop! So lovely! Thanks for sharing this! I am following you now and hope you can return the favor! I just started a blog in July and would love to have you follow me at http://carriescustomcards.blogspot.com/2015/09/psalm-33-card.html. Thanks! Your tag is a beauty!! The image is so fun!!! Congratulations!! Omg what a cutie just love this image. super cute! thanks for this opportunity!! Hi Tina am now a follower, love your card how cute is this image. Apart from the curlers as I have short hair I can see myself when I'm stumbling along at 56;30 in a morning to start to get my son up for work,what would our kids do without their mums?lol.Thanks for sharing. I love this image and am enjoying the blog hope. Awesome you are so very talented.